The other day I felt really burnt out after making 2 llama planters (amigurumi is the bane of my existence), so I decided to take a little creative break. After I finished making the totoro hoop a couple of weeks ago (now a couple of months as of this posting time, whoops), I wanted to make something else with the other 4" hoop I had left, but couldn't decide what to do with it. So while I was feeling very blah, the idea came to me: part crochet, part embroidery! This little hoop works up really easily, the only thing you need is time. 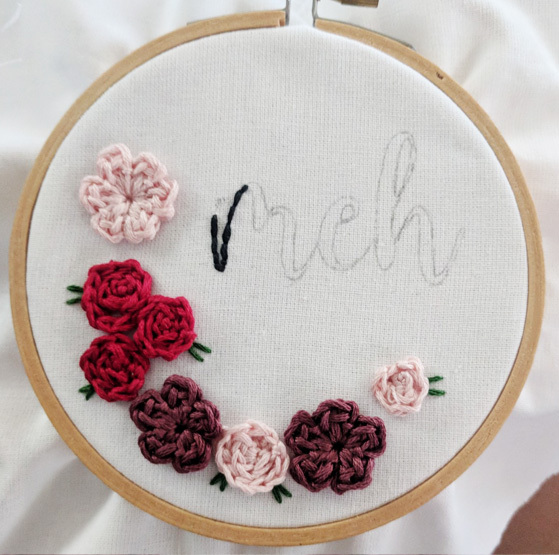 All of the flowers are crocheted with embroidery floss (you can also use crochet thread #10 or super fine yarn), and the leaves and text are embroidered. I used a simple back stitch because I don't really know anything else hahaha. But it came out super cute, so I don't think anything fancier is necessary. 2.75mm hook. Or slightly larger/smaller. Whatever you have is probably fine. Water soluble fabric pen or pencil or chalk or...something to write on your fabric with! First we'll make the flowers. There are 2 different flowers. Into the magic ring, make as many petals as you like. 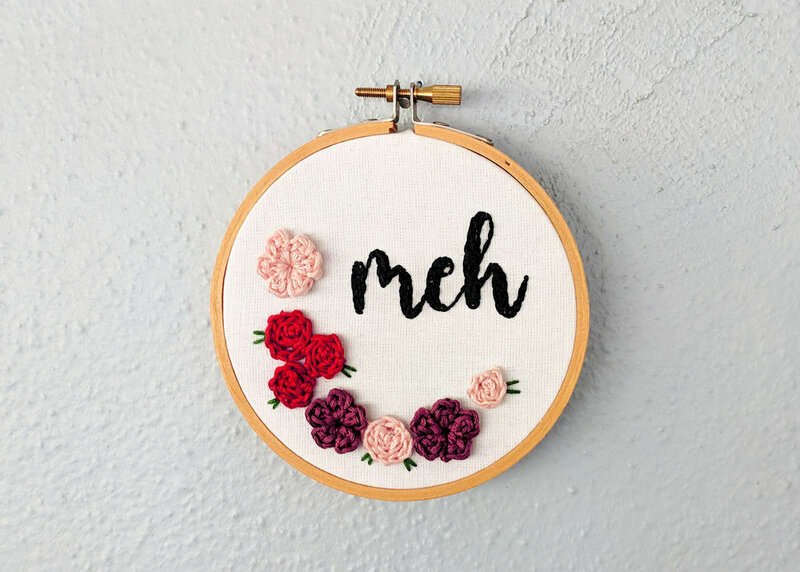 I ended up sewing on my flowers before I traced on the "meh," but I think it's a better idea to trace it first, THEN arrange your flowers. So print out the image here (print at 8.5 x 11), or hold up a piece of paper on your monitor and trace over it. Make sure you color over it with a dark black if tracing it. Then, tape the paper onto a bright window, and your fabric over that. Now you can trace the image onto your fabric. I couldn't find my water soluble pen at the time (I ended up buying a new one a few days later haha), so I just used a mechanical pencil. Since I used black thread, it was fine. If it ever gets wet, the pencil lead might run though, I'm not sure. 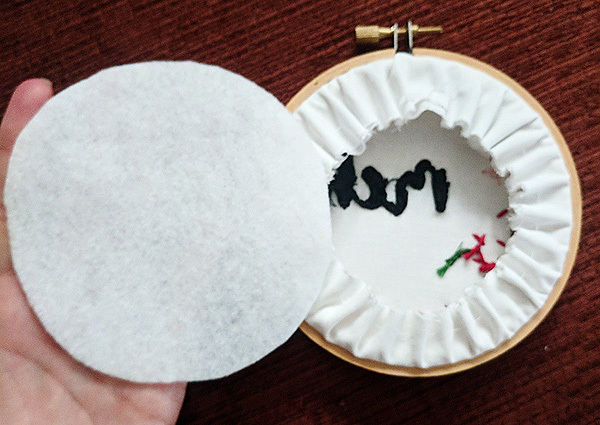 Once that's done, get your fabric into your hoop. 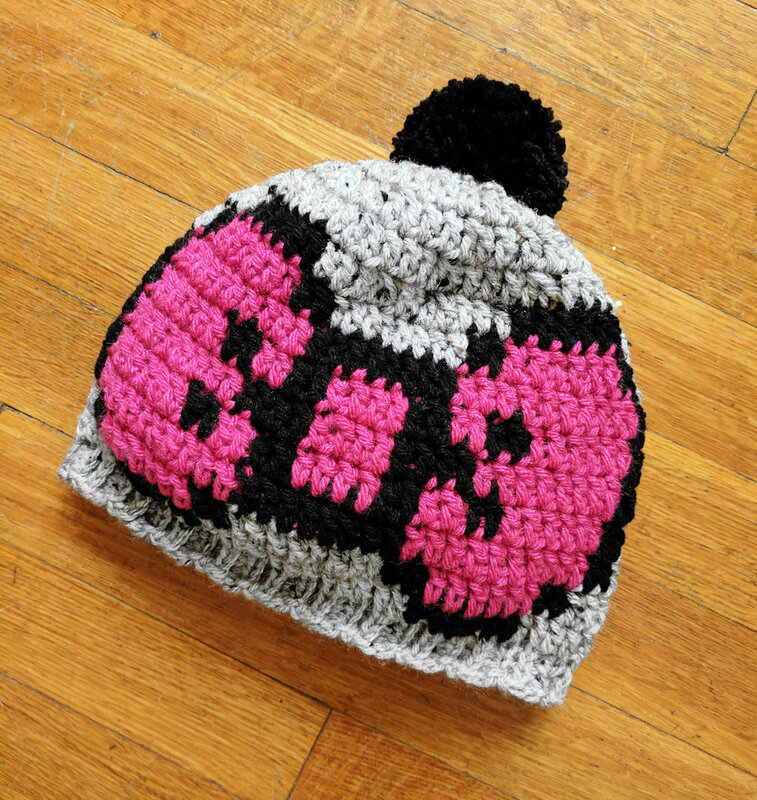 It doesn't have to be exactly where you want it, just get it nice and tight so you can embroider it! Use a back stitch to outline the entire thing. Once that's done, go back in & fill in the rest! This will take some time, but it looks sooo nice when it's done. Now play around with your flowers and decide how you want it to look. I did mine off center, but maybe you want to center yours? Maybe you want a bunch of flowers around the text? This project is so customizable. 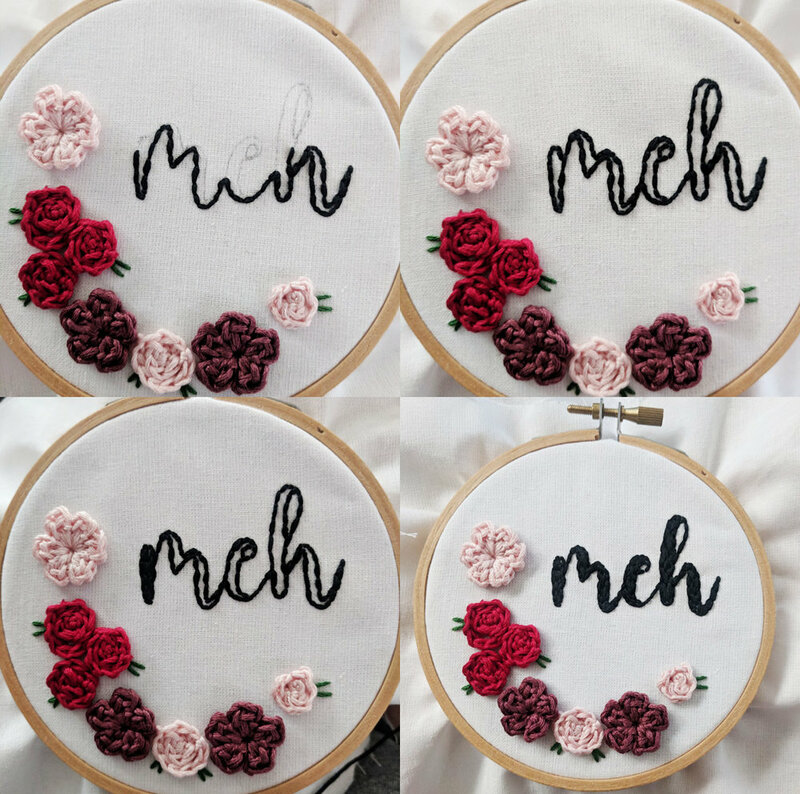 Be sure to move your fabric around in the hoop to see how it looks with your word & flowers in different areas. 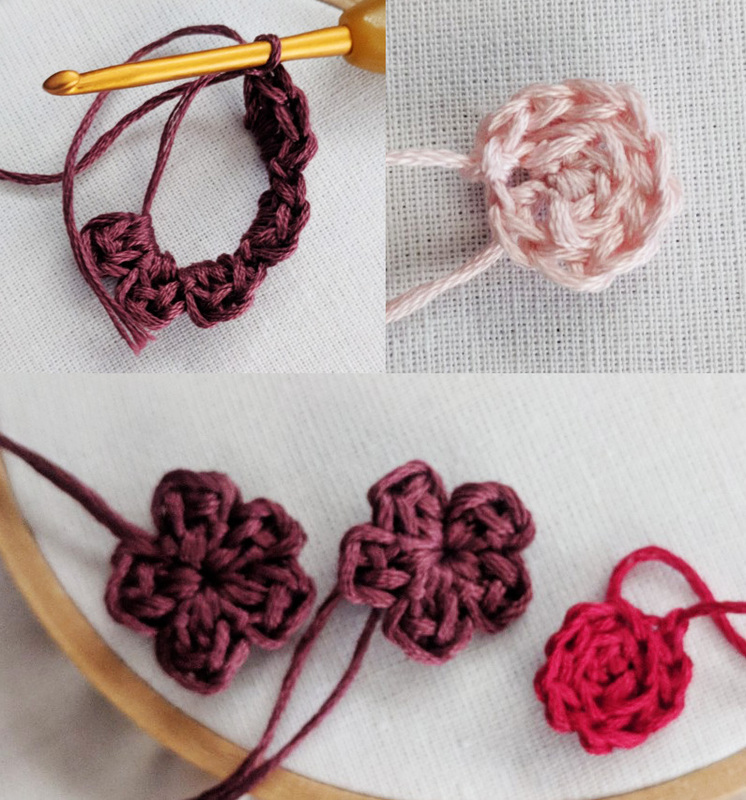 Once your flowers are laid out how you like, sew them on, then add a few little leaves. I only added leaves to the round flowers, but feel free to do it however you like. 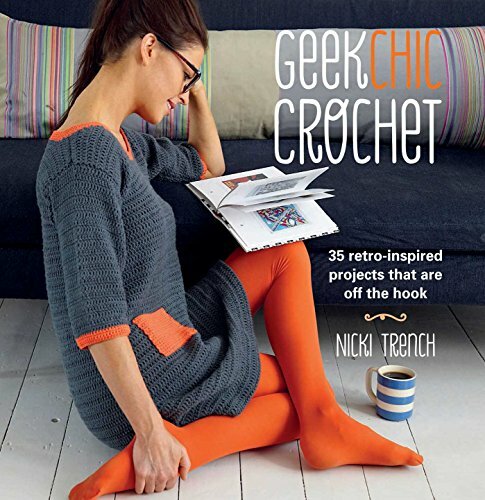 Now you'll need to finish your hoop! Follow the instructions below. 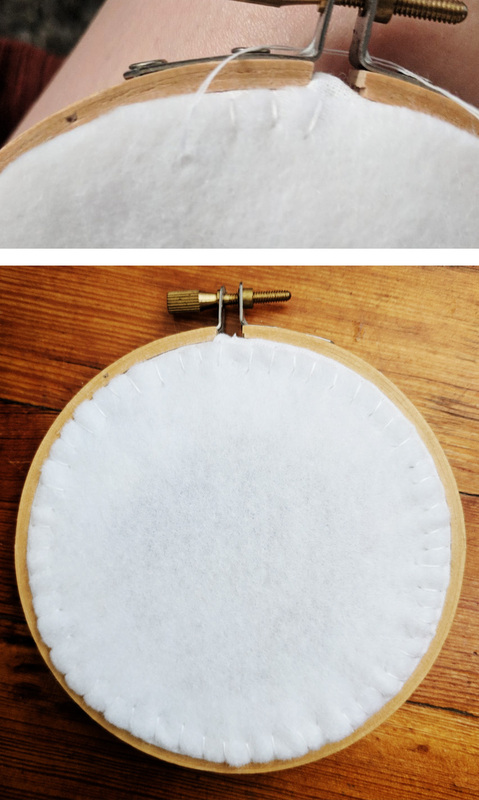 Trim your fabric around your hoop, leaving anywhere from a half inch to a full inch. This is about an inch. Now sew a running stitch around the edge and pull it tight & knot off. Finally, cut out a piece of felt and sew it onto the back. You can add a custom label or embroider something if you like. Aaand you're done! 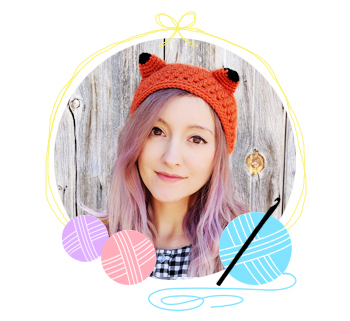 I hope you enjoyed this tutorial & have fun making your own crochet + embroidery hoop! Tag me on social media if you make one!